Summary High performance dual-band, dual-radio 802.11n router with bandwidth metering external USB drive and printer sharing w/ UPnP AV / DLNA media server, 'cloud' file access and completely new admin GUI. If you're looking to buy a NETGEAR router, you're faced with a lot of choices. NETGEAR groups its routers into four categories: Simple Sharing; Work and Play; High Performance; and Ultimate Performance. The chart below (Figure 1, courtesy of NETGEAR) shows a category / feature matrix. In this review, we'll be looking at the new features found in the WNDR3800 N600 Wireless Dual Band Gigabit Router Premium Edition, which falls into NETGEAR's High Performance category. Tim's previous coverage covered the 3800's routing and wireless performance and touched lightly on its features. In this review, I'll be covering the new features including the Genie Interface, Live Parental Control, CD-less installation and ReadySHARE USB storage and printer sharing capabilities. Before diving into the review, I thought it might be useful to help decode some of NETGEAR's nomenclature, which I first found confusing. Most of NETGEAR's routers also have a designation of Nxxx, such as N150, N300, etc. So here's a magic decoder ring. First, you'll notice that all of their routers with Nxxx designation are in increments of 150. 150 Mbps is the link rate or PHY rate for a single 802.11n stream. With that in mind, here are the rest of the N's. 130 300 Single band, dual stream.Some dual stream routers may employ three antennas. But the third antenna only enhances receive gain, which can help improve range. 217 450 Single band, three stream.This type has three antennas with a transmit / receive channel per antenna. 130 300 Simultaneous dual band (2.4 and 5 GHz) with dual-stream N.
217 450 Simultaneous dual band (2.4 and 5 GHz). One band supports two-stream N, the other three stream. You need to read the spec carefully to determine which one supports which. 217 450 Simultaneous dual band (2.4 and 5 GHz) with three-stream N on both bands. Note that your wireless client must support the same number of streams in order to achieve the maximum link rates. Some lower-priced netbooks and notebooks support only single-stream N. Most support two-stream, with three stream N harder to find. Again, you must read your specs carefully! The first thing that you'll notice about the WNDR3800 is that there is no installation CD. The reason is that NETGEAR is the first manufacturer to realize that CD/DVD ROM drives are becoming scarcer as the world moves to netbooks, ultrabooks, tablets and Wi-Fi enabled smart phones. Some households might not have a computer with a drive at all! Initially, I thought that a lack of a CD might cause some installation problems. Happily, I was wrong. NETGEAR has designed a way to do away with CD-based installation wizards entirely. By following the six steps in printed Installation Guide, you'll connect to your router in just a few minutes. NETGEAR supplies a yellow Ethernet cable that plugs into the yellow internet port on your router. The cable is even labeled "Plug into your Modem" on one end and "Plug into your router" on the other end. Once you power up the router, you merely type http://routerlogin.net and you're redirected to the web interface on the router. You don't have to type in an IP address such as 192.168.1.1, though that's the default address for the router. 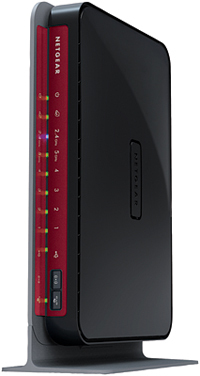 If you prefer to connect wirelessly, by default, the WNDR3800 is preconfigured with a unique SSID (Network Name) and a unique Network Key. This information appears both on a label on the bottom of the router as well as on the protective plastic film on the top of the router. Note that the same WPA passphrase is used for both 2.4 and 5 GHz bands. You can either manually configure your wireless connection using this supplied information, or you can press the WPS (Wi-Fi Protected Setup) button on the front of the router and use the WPS feature of your wireless client. http://routerlogin.net takes you to the home page shown in Figure 2. Here, you'll get your first glimpse at NETGEAR's new "Genie" interface. At the top of the screen, there are Basic and Advanced tabs. Below the Basic tab, there are menu selections that correspond to the six status icons that appear on the right side of the screen. Most users will never need to click on the Advanced options, as the major features are accessible from the basic interface.